We are located close to Reading & Pottstown but easily accessible from Philadelphia, Allentown, Lancaster, Harrisburg and other regions. From the east-Take Rt 422 to Rt 345. Make a left on 345 towards Birdsboro for one mile. Turn right on 724 head towards Reading for 3 miles until you come to the village of Gibraltar. 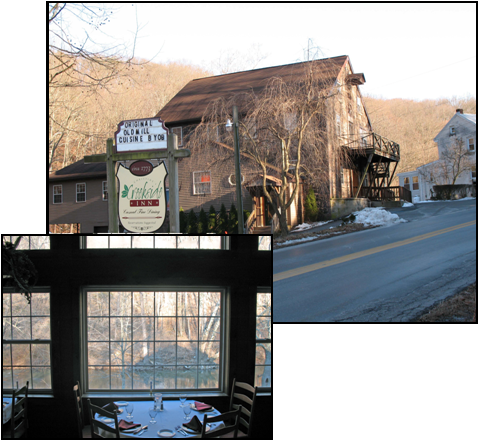 At the second traffic light turn left on to Rt 568 and go one mile, the restaurant is on the left side of the road. From the South-take 176 to 724. Turn right & go towards Birdsboro for 2.5 miles until you reach the village of Gibraltar and a traffic light intersecting state Rt. 568. Turn right on Rt. 568 and go for one mile and the restaurant will be on your left. From the North & West-Take 222 or Rt 12 to 422 and head east towards Pottstown. Turn right on to I-176 and take the first exit, 724. Turn left on 724 and head towards Birdsboro for 3 miles until you reach the village of Gibraltar. Turn right @ the first traffic light on to state Rt 568 & go for one mile restaurant is on the left. If no answer leave a message, we will contact you asap. Reservations are appreciated even if it is a slow day, we prepare all of our food and staff according to reservations. Please do not make reservations through email. You can make reservations on our website or by phone. Copyright 2008-2010 Christines Creekside Inn. All rights reserved.